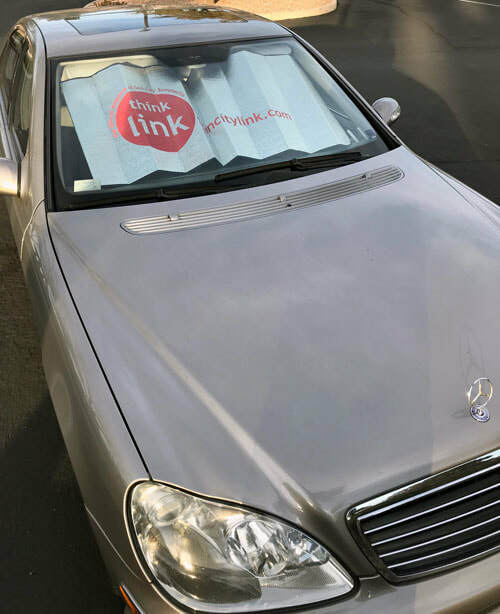 If you are the owner of this four-door, champagne Mercedes S-500 spotted by a Link photographer in the Mountain Shadows parking lot last week, get in touch with us to claim your prize! Come into our office at Mountain Shadows, email us (link@suncitylink.com) or call us (702-966-1436). Winners of the Spot the Dot Contest get a choice of a premier gift card and a Link Dot t-shirt. Congratulations! We look forward to spotting more dots around the community, so keep using your sunshades for a chance to win! Visitors to the Mountain Shadows Community Center may have noticed the work in progress on the building’s rooftop. The project, which is part of routine maintenance, started last week. 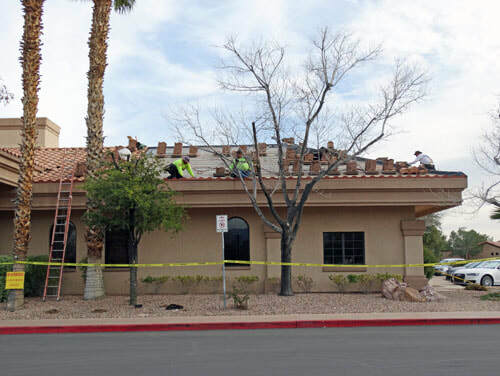 According to Brandon Balek, SCSCAI Building Maintenance Director, the project involves replacing the underlayment material that is nearly 30 years old, as well as replacing any cracked or broken Spanish roof tiles. 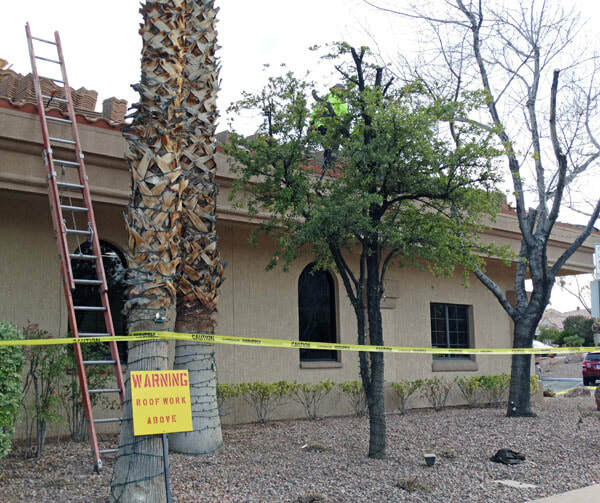 The work is being done by The Original Roofing Company and is expected to take another week or so. Residents visiting the Mountain Shadows Administration building are asked to be aware of the construction as it is occurring during daylight hours. The 2019 Dance Connection Expo, held in the Desert Vista Ballroom on January 28, was a huge success. Club members, instructors and visitors gathered for the event from 4:30-6:30 p.m. According to Dance Connection President Kris Steinwand, more than 150 attendees danced to, or were introduced to many different types of classes offered by the Club’s 11 instructors. The Expo is open to all Sun City residents to enjoy, and provides a great chance to learn more about the Club, as well as how dancing is a great exercise for the mind and body. The Expo, which is presented twice a year, features samples from the more than 20 classes offered each week. They include: hula, line dance, “Sittin’ and DanSin’,” Flamenco, ballroom, round dance, party dances and other classes that keep members “Movin’ and Losin’ ” (another great class) while having fun. Refreshments were provided by the Club, as were the door prizes. Over the past five years, the Dance Connection’s membership has exploded, from around 100 to its current 350 active residents. In a few weeks, the Club will launch its new website that will feature photos of all of all the class instructors, a schedule of classes along with descriptions, an Instructor of the Month profile and coming events etc. This is an urgent and important email. Please read it in its entirety and share it with as many of your Sun City Summerlin friends as you possibly can. Your attention to this matter may save us from the time and cost of having to reprint the ballots, the cost of postage to mail them out again and scheduling another election. This year you have FOUR total votes. There is misprint on the Ballot you received in the Link or if you receive your mail offsite in the mail. In error there are five circles following each name – Remember regardless of the amount of circles you can only fill in FOUR total. If when you fill in your Ballot the number of circles filled in total more than FOUR your ballot will not be valid. If you have already filled in your Ballot and you cast more than FOUR votes, please let me know and we will provide you with a replacement Ballot. The instructions on the Ballot on how to vote and the time period to vote are correct, if you follow the directions exactly you should have no problem. If you have any questions about this please email me at MitziM@suncitylv.com , or stop by the Membership Desk or any Monitor Station for assistance. My goal is to mitigate as much confusion, invalid Ballots and costs associated with this misprint as possible. This is one of those issues that I need your help with and I ask that your spread the word to everyone you know in Sun City Summerlin. Together we can make this a successful election and make this issue just a bump in the road to electing your 2019 Board of Directors. Please join me in getting the word out to everyone we can. 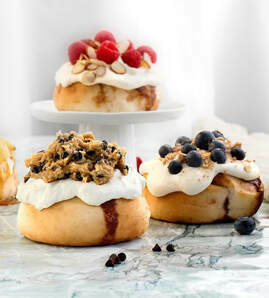 Follow Tammy as she heads to Cinnaholic in Centennial Hills. If you're planning on heading up to The Summit Restaruant, be sure to check out the February dining room schedule posted on Tammy's page. Dance Connection President Kris Steinwand calls out a raffle winner during the Club's Expo. Photo by Lori Korbel.